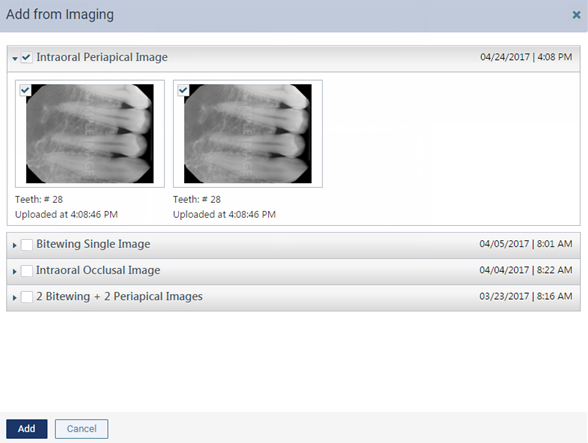 You can attach images that you have acquired using Dentrix Ascend Imaging to a claim. Click (or tap) a claim on the Unsent Claims page, the Sent Claims page, a patient's Insurance Claims page, or a patient's ledger. Note: If the patient has images for the same date of service as a procedure on the claim, a warning symbol appears. You can click (or tap) the symbol to view the warning message and click (or tap) a link to go to the Attachments tab. Click (or tap) Add Image. The Add from Imaging dialog box appears. Click (or tap) a procedure with the correct date of service to view the corresponding images. Select the check boxes of the images that you want to attach to the claim. Repeat this process as needed.